I can’t seem to figure out directBitmap(). 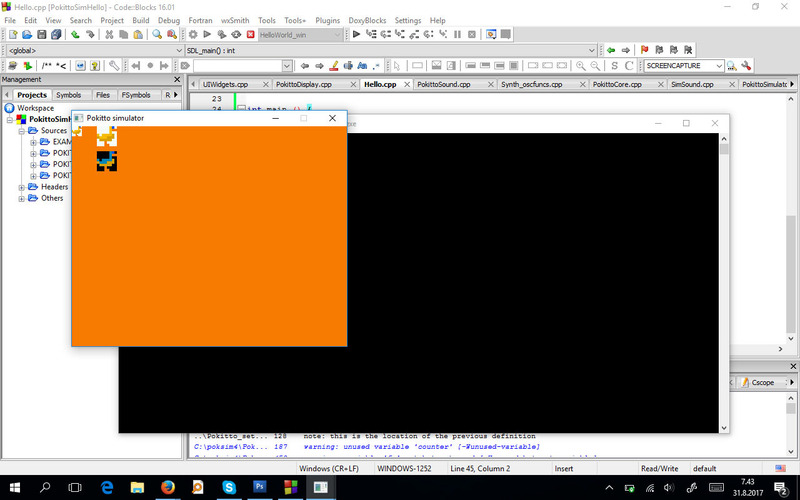 No matter what I do, I just can’t get my bitmap to render. The reason I need to print directly is because I’ll have more than 16 colors in total (16 per sprite) and I can’t have multiple palettes activated at once using the buffer. However, I can’t seem to find any documentation whatsoever about the function. Anybody know what I need to do? No matter what I try, it doesn’t work. All I get is a blank screen. I get the feeling that it has something to do with palettes; I used IMG2POK (that image conversion tool @HomineLudens made) to convert the images to code. Do you know if I’m supposed to do anything differently? I completely copied your code and ran it. All I saw was a nice orange color. No ducks. I’ll reinstall both when I have time. Strange glitches have happened to me before, such as the logo not showing up when the simulator opens. Logo not showing up: are you using a project copied from one of the examples or a ‘blank’ project? EDIT: Just made a new clone from repo, and copy-pasted @adekto code into HelloWorld_win project with results you see below. It seems @epicdude312 that something is wrong in your setup / project settings. @epicdude312 is any of the other sample code working? @jonne what exactly is game.update(true)vs game.update()is it just disabling the buffer? directPrinting allows you to print on top of the buffer ! Its needed for the console which will be added soon. The console already exits in my development version. I just haven’t tested it lately. It is very neat. ok my bad, question about overlapping direct images, they do flicker on hardware right? They flicker because of the drawing order. It depends which one gets drawn first. If you turn display persistence on and do a directBitmap on every update, the result should be the output of the buffer & directBitmap (or directText) on top of it. I will check what combination makes it work. A bit busy at the moment. Right, game.update(true) just skips drawing Pokitto buffer to the screen, but still does everything else, like key events, updates audio, etc. Huh, I had been having issues with the HelloWorld_win target as well. The game wasn’t using high-resolution mode. I reinstalled the simulator and it’s working fine now. The simulator code in the directory I copy to make new projects must’ve been corrupted or something. Okay, I’ve got a direct image world, and a player. The player is also a direct image, and flickers as can be seen here. Any ideas as to how I might go about resolving the flicker? I wouldn’t worry about it right now, as none of us have Pokittos yet for testing. The issue might not be noticeable on hardware. Actually, I am going to have to do something about this directBitmap craziness that you all have gotten involved in directBitmap is not optimized at all and I’m gonna be in major trouble if this trend continues.